Second year high school students Koichi Iwata (Aoi Nakamura) and Midori Kagawa (Minami Sakurai) have been friends since they were children. On their way home from school they see a meteor rising into the sky. The next day, Midori sees a shining shadow of a person at school. A rumor spreads at school of ghost. 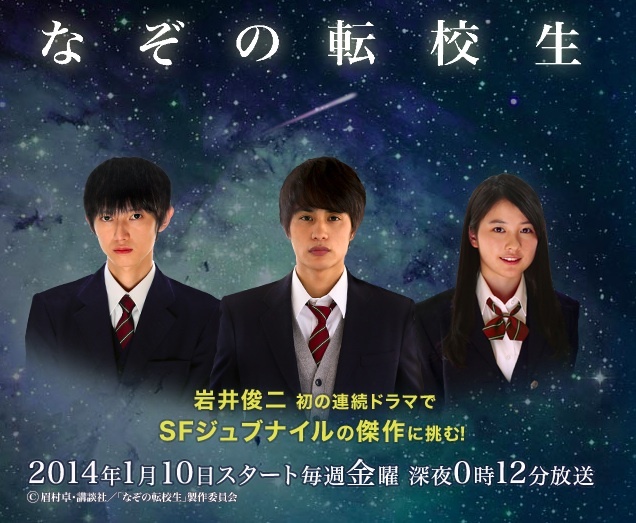 At this time, a mysterious boy named Norio Yamazawa (Kanata Hongo) appears in front of Koichi. Norio Yamazawa joins a baseball game and hits a home run. He is good at sports and smart, but something seems strange about him. He is the grandson of Ebara-san, who lives next door to Koichi. Since Norio has appeared, strange things keep occurring around Koichi. Based on novel "Nazo no Tenkosei" by Taku Mayumura (published 1967 by Seikosha). Good but short Jul 08 2016 1:39 am A good show, but way too short with too little happening. Plus, I wasn't really feeling any of the romance. Lala Oct 19 2015 1:04 am Aoi Nakamura brought me to this drama. Love it! jheidi Jun 30 2014 2:01 am kanata hongo is very cute! shopie Dec 03 2013 5:34 pm My two idol in one drama!??? Yay! XD How lucky i am... :3 <3 aoi nakamura & kanata hongo, you guys are the best!